The global aseptic paper packaging for flat top carton market is estimated to be valued at US$ 7,030.0 Mn in 2019 and is anticipated to grow at a CAGR of 5.5%, to reach a market size of US$ 10,766.1 Mn by the end of the forecast period. Aseptic paper packaging for flat top carton is a paper packaging type used for manufacturing flat top carton which are also known as UHT Carton or Liquid Brick Carton or Shelf Stable Carton. Liquid food products are usually packaged using plastics, which emit high CO2, creating a need for paper-based packaging like aseptic paper packaging for flat top carton. Reduction of carbon emissions is a global effort and several governments have implemented stringent regulations to reduce carbon emissions. The raw material that is used in aseptic paper packaging for flat top carton is bio-degradable and can be recycled. Elopak Inc. is focusing on 100% renewability and is replacing all its fossil-based raw materials with bio-degradable resources like aseptic paper packaging for flat top carton. In April 2016, Tetra Pak Inc. announced the launch of a new version of Tetra Top packages made of 80% renewable materials such as aseptic paper packaging for flat top carton. Longer shelf-life of aseptic paper packaging for flat top carton drives the process of distributing and supplying products efficiently. The high barrier feature of aseptic packaging carton helps increase shelf-life of liquid products, minimize waste, and effectively helps in the growth of the aseptic paper packaging for flat top carton market. Aseptic carton are tamper resistant and also have tamper-evident seals, which is also a positive factor for the growth of the aseptic paper packaging for flat top carton market. These cartons are brick-shaped, which ensures easy stacking. The increasing adoption of on-the-go food has led to the rise in demand for extended shelf-life paper packaging products like aseptic paper packaging for flat top carton. The removal of preservatives from packaging acts as a strong opportunity for the aseptic paper packaging for flat top carton market. As aseptic paper packaging for flat top carton retains the composition of beverages without adding any preservatives, the packaging technology is projected to help the beverage industry eliminate the usage of preservatives in the packaging of different products. The aseptic paper packaging for flat top carton market is projected to expand on the backdrop of the rise in per capita expenditure on prepared food and the increase in the working population. The aseptic process includes sterilizing of the package, sealing the carton under sterile conditions, and enhancing the shelf-life of the product without adding any preservatives. Therefore, the liquid packaging carton market has witnessed a shift toward aseptic liquid packaging cartons from conventional cartons in order to bring substantial efficiency benefits for the growth of the aseptic paper packaging for flat top carton market. 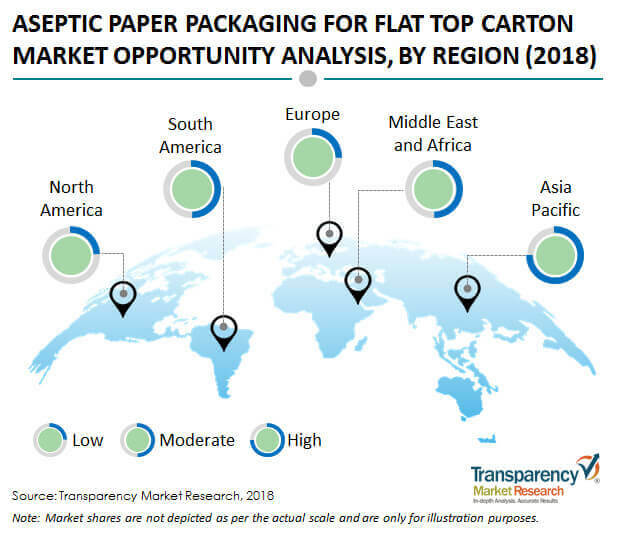 By region, the Asia Pacific is expected to be the most attractive market for the global aseptic paper packaging for flat top carton market in 2019 and is anticipated to witness a market share of 47.7% of the aseptic paper packaging for flat top carton market, by the end of 2027. Furthermore, North America and Europe aseptic paper packaging for flat top carton markets are expected to be the least attractive market while South America and Middle East & Africa aseptic paper packaging for flat top carton markets are expected to have a moderate attractiveness. In April 2016, Nippon Paper Industries Co., Ltd. collaborated with Tokuchu Tokai Paper Co. Ltd., to integrate their sales functions and optimize their production capacities in aseptic paper packaging for flat top carton. The key players profiled in the report on the global aseptic paper packaging for flat top carton market include – Refresco Gerber N.V., Nampak Ltd., Tetra Pak International S.A., Nippon Paper Industries Co., Ltd., Amcor Limited, Mondi Ltd., Elopak SA, Polyoak Packaging Group Ltd., IPI s.r.l., Weyerhaeuser Company, Uflex Ltd., Evergreen Packaging Inc., Ducart Group, Clearwater Paper Corporation, Lami Packaging Co. Ltd., TidePak Aseptic Packaging Material Co. Ltd., SIG Combibloc Obeikan (Pty) Ltd., Greatview Aseptic Packaging Co., Ltd., etc. In this report, Transparency Market Research (TMR) offers an eight-year forecast for the global aseptic paper packaging for flat top carton market during the period 2019 to 2027. In terms of value, the aseptic paper packaging for flat top carton market is expected to grow at a CAGR of 5.5% over the forecast period. The study of aseptic paper packaging for flat top carton discloses market dynamics in five geographic sections along with a study for the current market environment and future scenario over the forecast period. The key objective of this market research report is to offer key insights and identify trends related to the global aseptic paper packaging for flat top carton market. TMR studies the aseptic paper packaging for flat top carton market during the forecast period 2019 to 2027. The report on aseptic paper packaging for flat top carton market is intended to empower the reader to get a clear viewpoint of the current as well as forecast scenario for the next eight years. Key figures and numbers given in the global aseptic paper packaging for flat top carton market report have been considered based on the consumption and weighted average pricing of aseptic paper packaging for flat top carton on the basis of their paper type. Market sizing for aseptic paper packaging for flat top carton has been calculated in the context of different regions. All the segmentation provided in the aseptic paper packaging for flat top carton market report has been deliberated after suitable secondary research and revalidation of the data. We also carried out a top-down approach for assessing the market size for aseptic paper packaging for flat top carton by each country. Market shares of the manufacturers of aseptic paper packaging for flat top carton have been valued based on the data related to the revenue provided by key manufacturers. The aseptic paper packaging for flat top carton market has been forecast based on constant currency rates. To ensure the reliability of the data provided for the aseptic paper packaging for flat top carton market, several number of primary and secondary interviews were conducted during the passage of research to check for validity. Few of our secondary sources for valuation of the aseptic paper packaging for flat top carton market included World Bank, Packaging Digest, Factiva, and Hoover’s, as well as the manufacturing company’s annual reports & publications. The executive summary for the aseptic paper packaging for flat top carton market report is intended to provide a clear and brief understanding of the current and forecast scenario of the global aseptic paper packaging for flat top carton market, along with its key drivers and opportunities. The global aseptic paper packaging for flat top carton market has been considered in a comprehensive way, which includes segmentation by paper type, thickness, packaging structure type, and end use. The segments given for the global aseptic paper packaging for flat top carton market have been considered in terms of Basis Point Share to comprehend the relative offerings of each segment. This widespread level of info is essential for recognising several key trends in the aseptic paper packaging for flat top carton market. Another important feature of the aseptic paper packaging for flat top carton market report is the study of important segments in terms of absolute dollar opportunity. Absolute dollar opportunity is important for evaluating the scope of opportunity that aseptic paper packaging for flat top carton manufacturers can look onward to achieve as well as to identify potential assets from a delivery perspective of the aseptic paper packaging for flat top carton market. To comprehend the key growth segments, TMR developed the aseptic paper packaging for flat top carton market attractiveness index. The market attractiveness analysis given for the aseptic paper packaging for flat top carton market is a qualitative demonstration of market statistics. In the last section of the report for aseptic paper packaging for flat top carton, a competition landscape section of the companies is given for relating the current manufacturing scenario and its impact on the global aseptic paper packaging for flat top carton market. However, it is largely designed to offer clients a comparative valuation of key manufacturers related to the segments of the aseptic paper packaging for flat top carton market. Key players which have been profiled in the report on the aseptic paper packaging for flat top carton market include – Refresco Gerber N.V., Nampak Ltd., Tetra Pak International S.A., Nippon Paper Industries Co., Ltd., Amcor Limited, Mondi Ltd., Elopak SA, Polyoak Packaging Group Ltd., IPI s.r.l., Weyerhaeuser Company, Uflex Ltd., Evergreen Packaging Inc., Ducart Group, Clearwater Paper Corporation, Lami Packaging Co. Ltd., TidePak Aseptic Packaging Material Co. Ltd., SIG Combibloc Obeikan (Pty) Ltd., Greatview Aseptic Packaging Co., Ltd., etc. Manufacturers of aseptic paper packaging for flat top carton are nowadays targeting consumers which prefer on-the-go beverages. Key manufacturers of aseptic paper packaging for flat top carton are focused on single-person households who mostly prefer on-the-go beverages. All these factors are expected to create positive opportunities for aseptic paper packaging for flat top carton during the forecast period 2019 – 2027.